In my previous post I have shown you a way to import quicly an application in MDT with a right-click. In this post I will show you the same process using a different method. In the first version you had to fill an "Application.xml" file with your application information. In this version this part is replaced with a GUI. If your application folder sources is named as in MDT "Publisher Name Version" these fields will be automatically set in the GUI using the folder name. 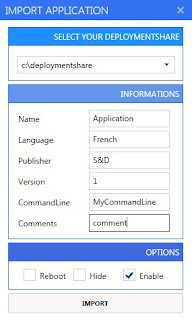 You can find in c:\windows\import_appli_mdt a DeploymentShare_List.xml file. 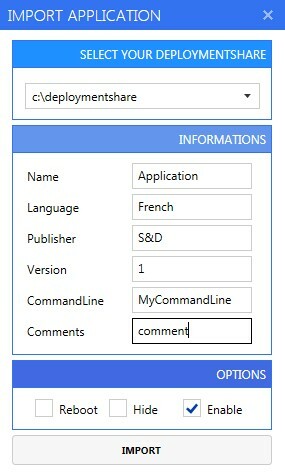 This file is used to select your deploymentshare. 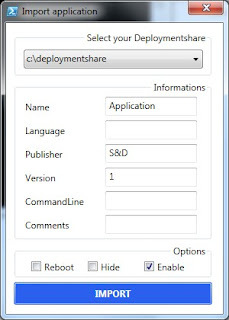 Paste your deploymentshare path in the path node. If you have several deploymentshare add them in this file. 2 / Click on "Import this application in MDT"
A prettier GUI version is also available. To use it you need at least Powershell v3 and Net Framework v4. 4 / Fill the application informations. Name and CommandLine are mandatory fields. 5 / Click on "Import"
1 / You can find a folder c:\windows\import_appli_mdt containing both GUI versions. 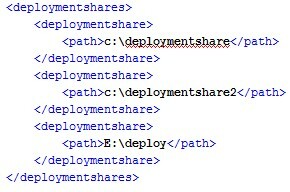 2 / Fill your deploymentshare in the file deploymentshare_list.xml. Thanks to Stephen and Seb for their good suggestions.